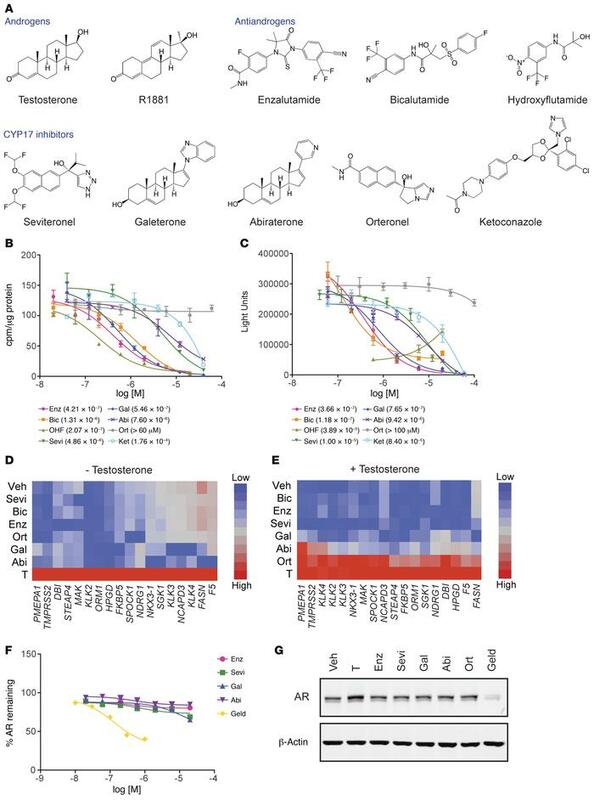 CYP17 inhibitors bind and inhibit AR transcriptional activity. (A) Structures of the compounds used in this study, including androgens (testosterone and R1881), benchmark antiandrogens (enzalutamide, bicalutamide, and hydroxyflutamide) and CYP17 inhibitors (seviteronel, galeterone, abiraterone, orteronel, and ketoconazole). (B) HEK293 cells were transfected with the WT-AR and treated with 0.1 nM [H3]-R1881 and a competitor ligand at the indicated doses for 2 hours. Lysates were subjected to scintillation counting and normalized to total protein amounts. Values in parentheses indicate the IC50 of each compound. Error bars represent the SD of duplicate samples from a representative experiment performed in triplicate. (C) CV1 cells were transfected with the WT-AR, MMTV-Luc, and Renilla-Luc and then treated with 0.1 nM R1881 and the indicated dose of antagonist for 24 hours. Dual-luciferase values were measured and normalized to Renilla-Luc. Error bars indicate the SD of triplicate samples of a representative experiment performed in triplicate. Quantitative PCR (qPCR) analysis was performed, and heatmaps were generated for AR target gene activation of LNCaP cells treated with (D) vehicle DMSO (Veh) or (E) 10 nM testosterone and 10 μM of the indicated ligand for 24 hours. (F) In-cell Western analysis using an AR antibody was performed on LNCaP cells treated with increasing concentrations of the indicated ligand for 24 hours. Geldanamycin (Geld), an HSP90 inhibitor, was included as a positive control for AR degradation. AR protein expression was assessed using the LI-COR Odyssey imaging system, normalizing to DRAQ5 (DNA dye). Error bars represent the SD of triplicate wells of a representative experiment performed in triplicate. (G) Western blot analysis was performed on LNCaP cells treated with vehicle DMSO, 1.0 nM testosterone (T), 1.0 μM geldanamycin, or 10 μM of antagonist for 24 hours. Blots were probed for the AR or β-actin as a loading control. Abi, abiraterone; Bic, bicalutamide; Enz, enzalutamide; Gal, galeterone; Ket, ketoconazole; OHF, hydroxyflutamide; Ort, orteronel; Sevi, seviteronel.